Just like caviar.. this is a delicacy for me…. I used to wait for the mussel season… my grand mom would get them from the fish market and fry/ make a curry out of them. Wash the mussels with their shell. Boil them in water to separate the meat from the shell. Drain them dry. Once cooled, separate the mussels from their shell. Drain any water if present. Tip: I used ready de-shelled mussels. Since I was shallow frying them, I cooked them in boiling water for 5 minutes, prior to frying. If you plan to deep fry them, you don’t need to cook them before frying. Mix Rice flour, asafoetida and chili powder along with salt. I mentioned a big pinch of asafoetida as mussels are known to cause gastric problems, asafoetida helps to resolve this. So make sure the mussels have a strong smell of asafoetida. Sprinkle some water if the mussels are very dry, else they won’t get coated with this batter. In the end add the semolina and mix again. 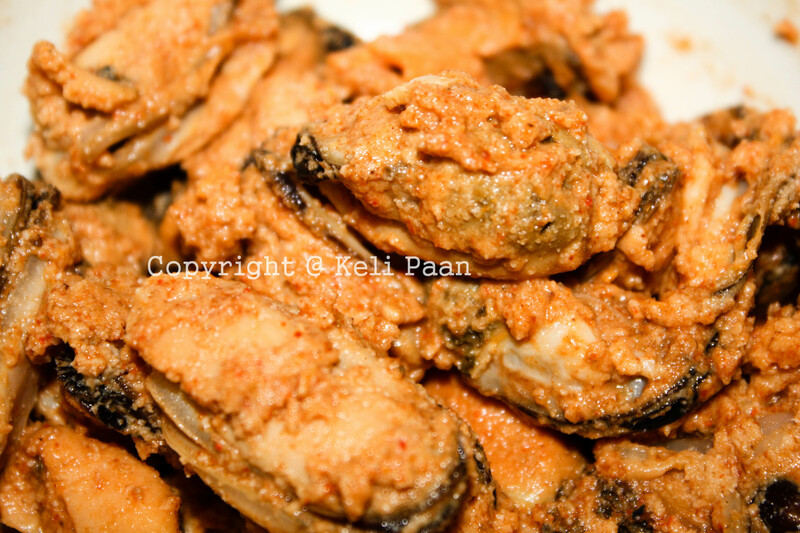 Alternately, you can marinate the mussels with only chili powder, asafoetida and salt. 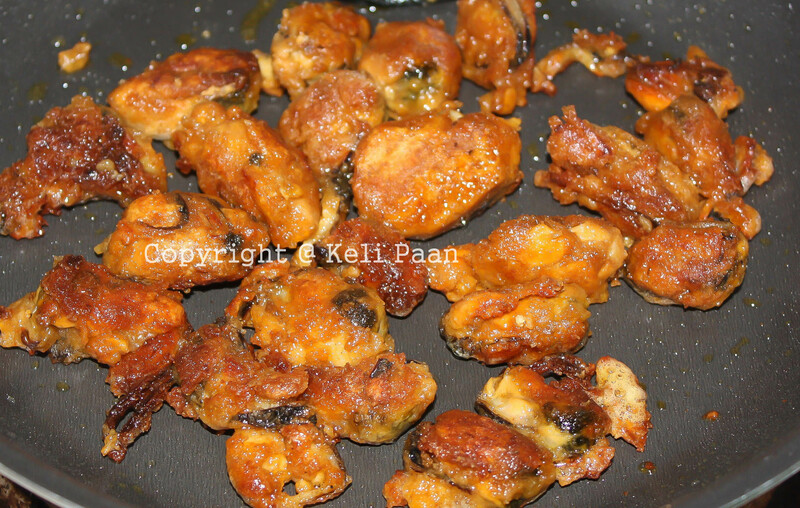 Later on just before you fry them you can add the rice flour and semolina to a bowl, mix both of them well. coat each mussel and then fry. Keep this coated mussels aside for a while. An hour should be fine. You can fridge/freeze it for a few days. The longer you marinate, better is the taste. Heat oil in a fry pan. Make sure there is enough oil because we need to shallow fry the mussels. You can also deep fry them if you would like to. I do not generally because there is a lot of oil that is wasted and I cannot use it for any other purpose as they have the flavour of mussels in them. Serve hot with any dip if you choose to. They taste fantastic just by themselves too. 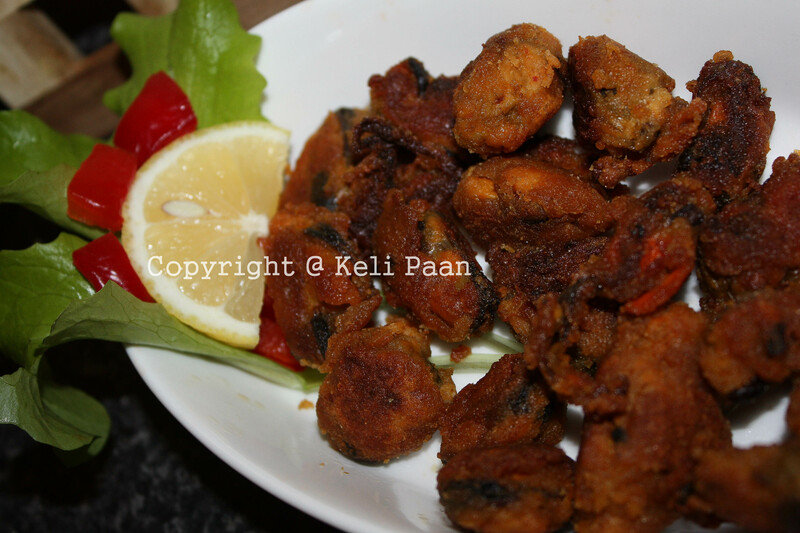 If you liked this recipe, you may also enjoy – Tangy Mussels, Lemony Prawns with Parsley, Prawn Pepper Fry – Kerala style, Tava fried prawns, Fish Fry with a Konkani style batter etc. Tugele last comment was like the icing on the cake.I luv mussels. Is your grandma from kerala by any chance? cuz only people from kerala enjoy mussels fry esp the fry ingredients u mentioned.My grandma as well prepares the same way except that mussels are fried without boiking them initially. Thanks for reminding me to add this tip. If you plan to deep fry you don’t need to cook them before frying. I cooked them earlier because I was shallow frying them.